Without a doubt, Perry Lane Hotel. If you’re looking for a hotel in a central location, with modern swank, incredible hospitality and plenty of amenities, this is the place for you! Although Perry Lane is pricier than other hotels within the area, we definitely felt as though it was worth it. In the warmer months, you can enjoy bocce ball, swimming in the rooftop pool and soaking up 360-degree views from the rooftop bar; you can wind down the evening at the hotel bar (we grabbed night caps every night here) and enjoy a delicious meal at the hotel restaurant: Emporium. From the bold wallpaper in the elevator, sleek exterior and modern hotel rooms, we loved everything about our stay at Perry Lane. -Collin’s Quarter: A must for brunch! From it’s beautiful interior to its weekend brunch menu, this is the place to go (and worth the wait if you don’t have a reservation!) I should also mention, they have an excellent boozy brunch menu. My cousin Alex and I dined inside the restaurant and indulged in mimosas and benedicts. I highly recommend the Crab Benedict (a perfect mix of southern/seafood). The portions are filling, so you’ll definitely need to walk it off after. 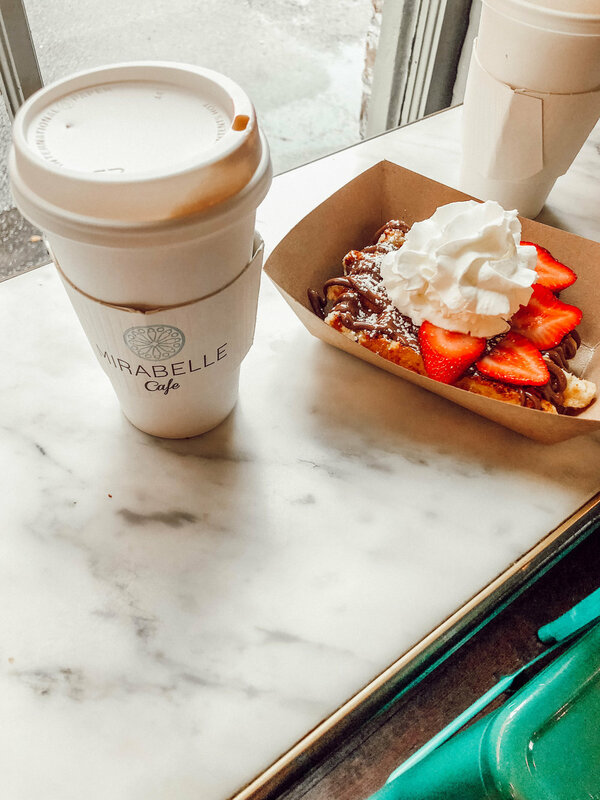 -Mirabelle Cafe: We ate here for our second breakfast of the trip and indulged in Belgium waffles and lattes. And wow, were they good and the perfect size! They have lots of variety on the menu, depending on if you’re a sweet or savory person. Alex got the nutella + strawberry waffle and I opted for the lemon curd and raspberry waffle. 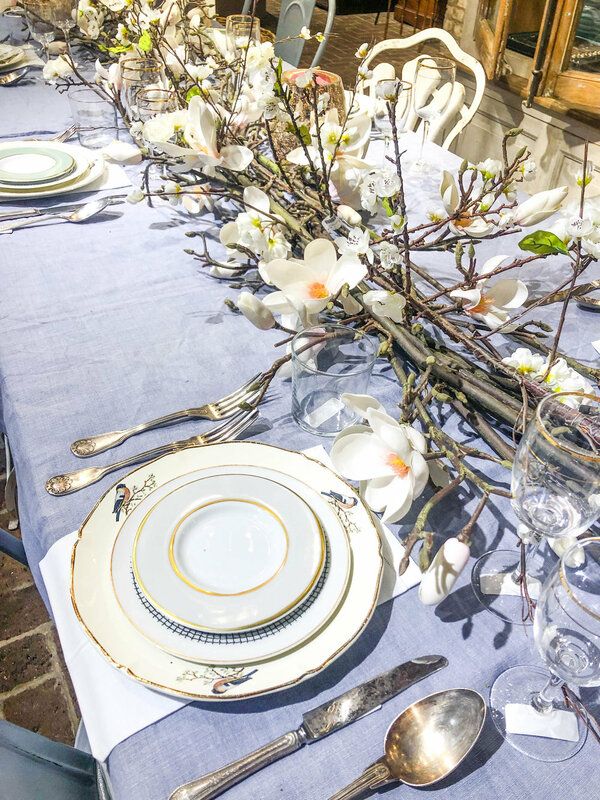 The cafe is located in a beautiful, southern home with a little bit of a Parisian twist. Picturesque and the perfect Sunday breakfast spot. -Soho South Cafe: We grabbed lunch inside this adorable restaurant/cafe. 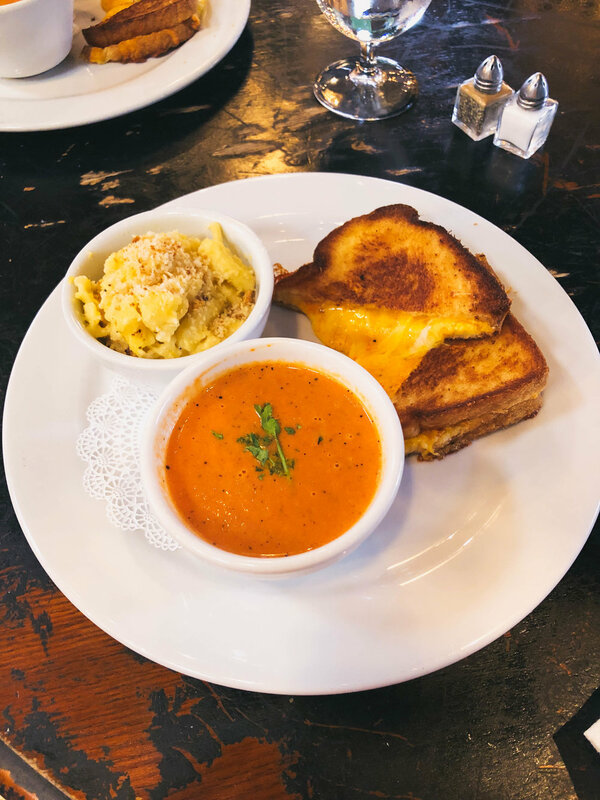 We wanted some comfort food to combat the rainy weather so we opted for grilled cheese sandwiches — highly recommend. The inside of the restaurant is decorated with an eclectic mix of painted doors hung up on the wall, strung up lights, a large clock in the center of the restaurant and a garage door. 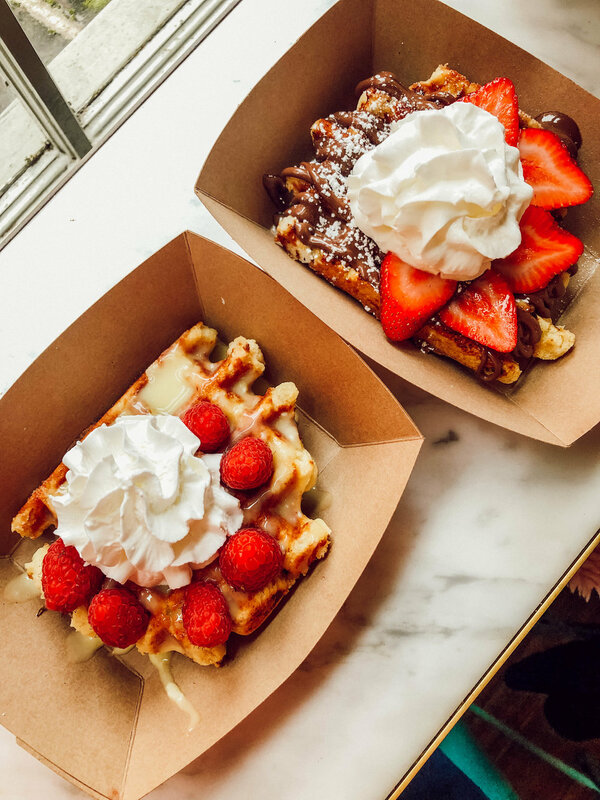 -Leopold’s Ice Cream: Not only is the exterior of this ice cream shop worth an Instagram pitstop but the ice cream is delicious too! I stopped off for a scoop after shopping along Broughton Street. I assume this place must be packed in the summer when humidity becomes a harsh reality in the south. -Emporium at Perry Lane: As I mentioned, our hotel restaurant was a personal fav. I actually ate here four times during my stay (two breakfasts and two dinners) and had incredible meals each time I dined. Whether you’re sitting in the bar or the main part of the restaurant, the menu has plenty of options to choose from whether you’re craving seafood, meat, veggies or southern comfort food. WHERE TO GRAB A DRINK: Alex and I learned the bars don’t stay open as late in Savannah as other cities AND bear in mind, if you’re staying on a Sunday, most bars open late or aren’t open at all. So plan accordingly. One pro-tip for Savannah: you can walk around with an open container. Meaning, you can grab your mimosa to-go and it becomes your to-gosa! -Artillery: We kicked off our evening bar crawl at Artillery. This bar has incredible craft cocktails, an impeccable interior (marble, dim lighting and modern seating). No flip-flops and tank tops here, this is a swankier bar that will make you feel under-dressed if you’re wearing anything less than heels. -Wayward at Emporium: Our hotel bar also specialized in craft cocktails and also has a built-in arcade within the bar so you can drink and play games! We visited this bar every night for a night cap and were impressed every time with the bartender’s concoctions. 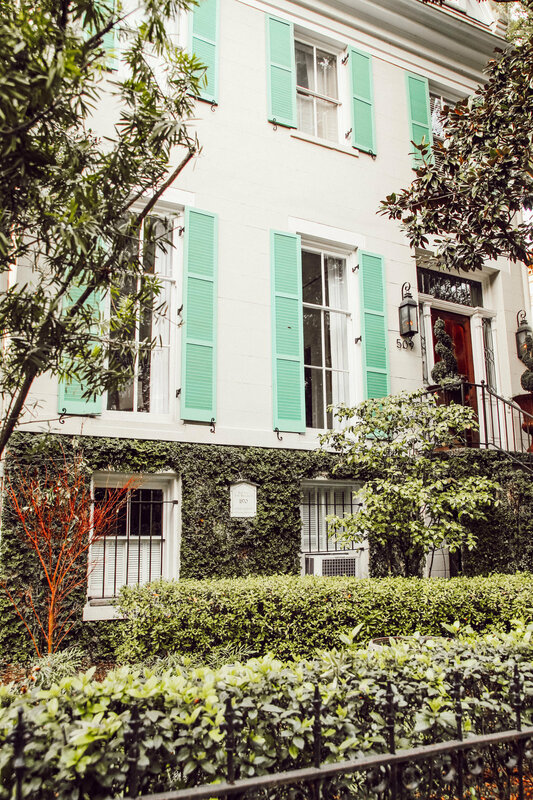 WHERE TO SHOP: Savannah has several districts you can shop. As I mentioned, the city is extremely walkable and is pretty much setup in a grid with lots of squares in between so you can tackle the majority of the shops in a day. -Paris Market: One of my favorite shops I visited on Broughton Street. There are two levels you can shop, the first level has books/magazines/cards, a cafe and smaller trinkets for gifting and downstairs consists of interior/decor items. The interior and exterior of this shop is pure Instagram eye candy. -Broughton Street: Wander up and down Broughton Street for shops — some of which are larger name stores and others are more boutique-y. Lots of restaurant options are along Broughton Street as well so you can stop off to take a break from the humidity, if needed. -Shop SCAD: As I mentioned, Savannah is the home of SCAD, and being a design student graduate myself, I wanted to stop into the SHOP SCAD to see what local students were creating and selling. This store is constantly rotating student artwork from framed art, jewelry, candles, tote bags, apparel and more! -Do a walking ghost tour: Did you know that Savannah is supposedly one of the most haunted cities in the United States? I was intrigued by this and the fact that every travel guide mentioned a ghost tour was a must do while visiting Savannah. My cousin and I signed up for a 1.5 hour walking ghost tour which ended up being less creepy than we anticipated and more so, a great history lesson of Savannah and how much the city has changed over the decades. 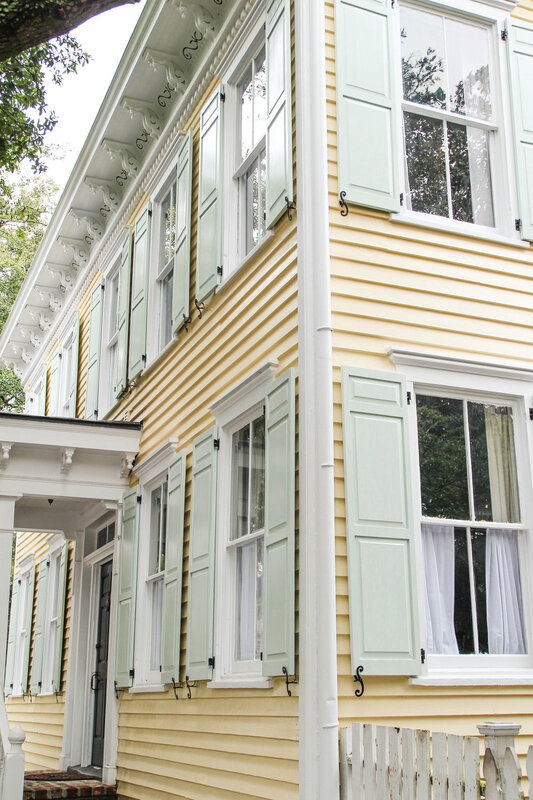 -Visit Rainbow Row: although smaller than Charleston’s Rainbow Row, it’s still worth the visit. 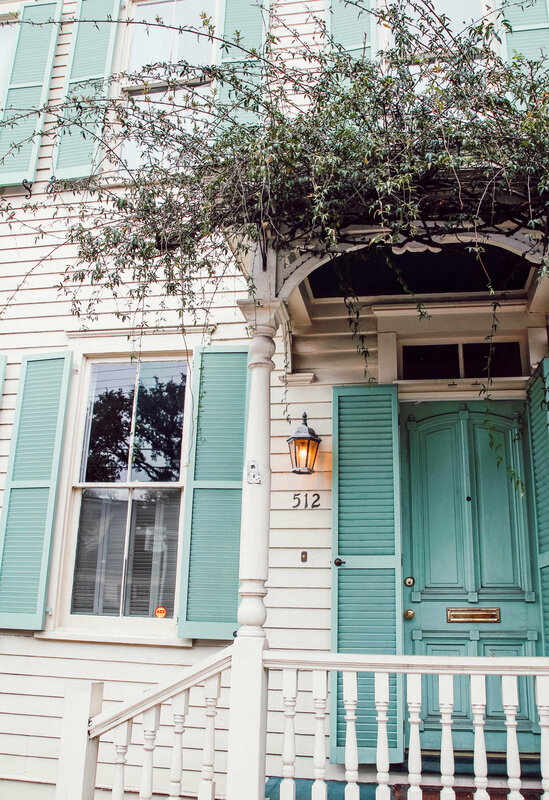 Located on 508 East Bryan Street, you can check out the three homes that show off their pastel hues and southern charm. We also wandered along Bryan Street and the neighboring square as the homes here were rather charming to photograph. -Stop by Forsyth Park: this park is large but extremely walkable. 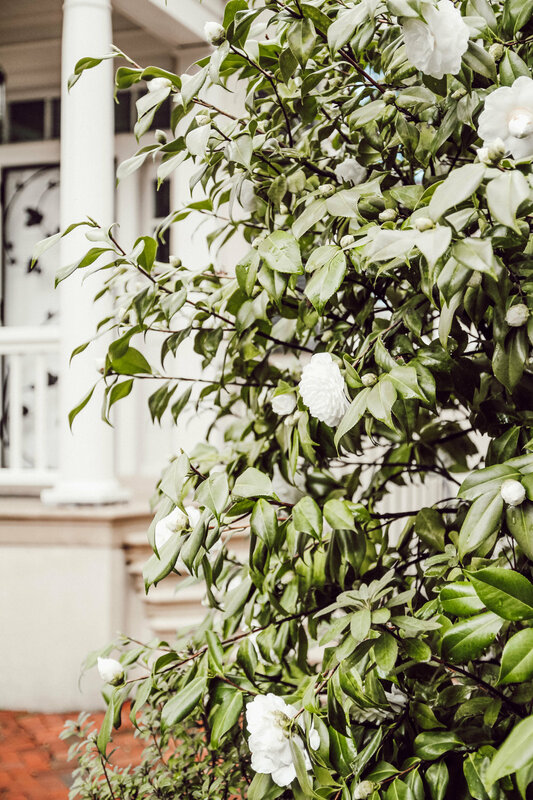 Located in the center of Savannah, you can visit the central fountain of the park, soak up the sights of the Spanish moss trees and photograph the homes that surround the park. You really feel the history when you visit this park! -Wander through the Historical District: Savannah is setup like a grid, very walkable, but sometimes you have to walk a bit to get to the photogenic streets. Look no further than the Historical District for all of your photography needs. 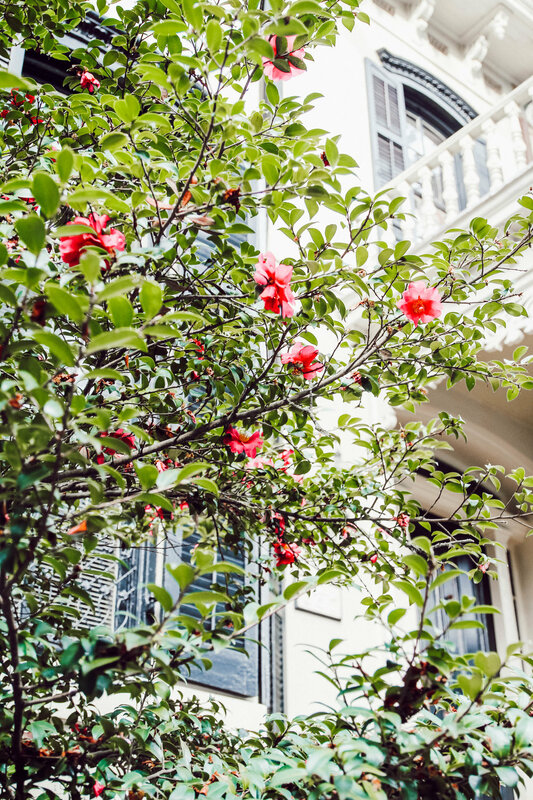 From the Spanish moss draping in the streets to the old homes with flickering lanterns and colorful front doors, we were swooning as we meandered our way down Jones Street - the heart of the Savannah Historical District. Overall, Savannah made for a wonderful weekend getaway. It’s truly amazing visiting a place on the complete opposite side of the country that feels so different from where I live! I highly recommend Savannah for a weekend visit especially during the winter/spring months where humidity is practically non-existent which makes sight-seeing that much more enjoyable.